I really need a time turner like Hermione in Harry Potter. I need more time! Teleportation definitely – no more wasted hours on the M6! Thanks for entering, Simon. Good luck! 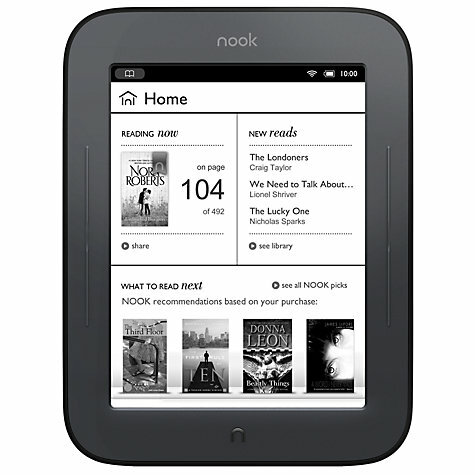 As the owner of a Kindle already I promise to auction the Nook if I win and donate all the proceeds to Mind. Ha! Brilliant comment, Alistair – thank you! And good luck! I would live to be able to slow down (or speed up) time relative to myself. Get more reading done, but also be the most “skilful” sportsperson in the world by being able to anticipate the opponents every move and get to the ball/line first. And to fight crime of course. Ooh, I like your thinking… Good luck in the draw and thanks for entering! i would love to be like samantha in bewitched, be able to wiggle my nose to instantly tidy the house up, or set the table with an amazing meal and whisk my family and i off to a deserted sunny island for a fab holiday!! Excellent plan, Tamalyn – thanks for playing! I would love to be able to fly, just flap my arms and go. Just think how quick you could get to places. Flying was my first though, Jayne, but then I remembered my vertigo… Thanks for entering and tweeting – I’ll put your name in the hat twice! A self-cleaning house would be most welcome… Thank you for entering and good luck! I would like to have healing powers. Imagine being able to just touch somebody to cure them of any serious illness! The perfect magical power! Thank you for entering! You know, I think I’d be quite scared to read minds, although I’m sure it would come in handy at times 😉 Thank you for entering/tweeting! I would love to be invisable so I could hide from my kids ! Brilliant! Thanks for entering and tweeting, Rachel. After sitting through a day of dreary nasty weather I would love to have the ability to control the elements. Thanks for the Giveaway op and I tweeted the info. The book sounds great and has been added to my TB list (I have to quit visiting new to me authors that list is turning into a book, lol) Congratulations on the release. I hear you re. the weather, Michelle 🙂 Thank you for your kind words about my book, too. Good luck in the prize draw! Tough choice but in the end I’d have to go for a non-selfish power and have the ability to weapons into flowers to bring about world peace. Congratulations on the book. Great idea and thank you for entering! Thank you for the congratulations, too; they are greatly appreciated. Invisibility for me, then I could sneak into Ryan Gosling’s house. It’s not illegal if no one can see you, right? I like your style, Tamsyn! Thank you for entering and best of luck. Flying *would* be awesome! Thanks so much for playing, Kelly, and good luck! I would love the ability to time travel. Imagine being able to go back in time and witness and experience some of the most amazing happenings that we can only ever know about through reading. Hi Lynn, thank you for entering and tweeting (and for following, too) – it is much appreciated! I love the idea of time travel! I am actually grateful to the owner of this web site who has shared this fantastic post at at this time.